The abundance of electronics in the home, in the workplace, and all around us has led to a sharp downturn in the amount of paper we use – but this poster is bringing paper and electronics together. 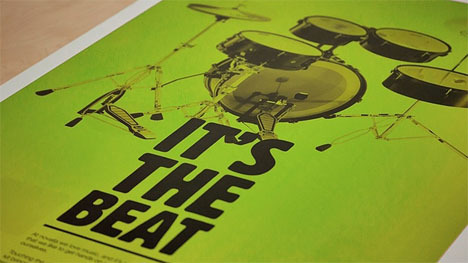 The drum beat poster was created by a UK team of scientists, designers, and programmers called Novalia. With just your fingers, you can play a full seven-piece drum kit. 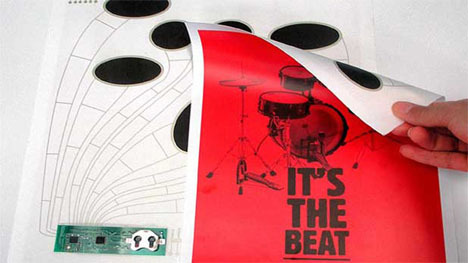 The posters are printed with electrically conductive ink that makes up a number of touch sensors. These sensors are attached to a simple circuit board. Just like a capacitive touchscreen on a phone or tablet, the poster recognizes your touches and plays corresponding drum sounds. Two versions of the poster are in development: one connects via Bluetooth to your iPhone or iPad so that you can play along with your favorite music. The other would integrate a speaker into the poster’s surface. On both versions, the electronics module is separate from the paper and cardboard components, so the posters would be simple to recycle.